New technology developed by Howard Hughes Medical Institute (HHMI) researchers makes it possible to test for current and past infections with any known human virus by analyzing a single drop of a person's blood. The method, called VirScan, is an efficient alternative to existing diagnostics that test for specific viruses one at a time. With VirScan, scientists can run a single test to determine which viruses have infected an individual, rather than limiting their analysis to particular viruses. This unbiased approach could uncover unexpected factors affecting individual patients' health, and also expands opportunities to analyze and compare viral infections in large populations. The comprehensive analysis can be performed for about $25 per blood sample. Dr. Stephen Elledge, an HHMI investigator at Brigham and Women's Hospital in Boston, led the development of VirScan. "We've developed a screening methodology to basically look back in time in people's [blood] sera and see what viruses they have experienced," he says. "Instead of testing for one individual virus at a time, which is labor-intensive, we can assay all of these at once. It's one-stop shopping." Dr. Elledge and his colleagues have already used VirScan to screen the blood of 569 people in the United States, South Africa, Thailand, and Peru. The scientists described the new technology and reported their findings in the June 5, 2015 issue of Science. The Science article is titled “Comprehensive Serological Profiling of Human Populations Using a Synthetic Human Virome.” VirScan works by screening the blood for antibodies against any of the 206 species of viruses known to infect humans. For one of Britain's best-loved and most colorful group of insects, ladybirds (known as ladybugs in North America), the brightness of their color reveals the extent of their toxicity to predators, according to new research undertaken at the Universities of Exeter and Cambridge in the UK. The study, which was published online on June 5, 2015 in an open-access article in the journal Scientific Reports, also found that the more conspicuous and colorful the ladybird species, the less likely it is to be attacked by birds. The article is titled “Signal Honesty and Predation Risk Among a Closely Related Group of Aposematic Species.” Lina María Arenas, a Ph.D. student at the Centre for Ecology and Conservation at the University of Exeter and from the University of Cambridge, said: "Ladybird beetles are one of the most cherished and charismatic insects, being both beautifully colored and a friend to every gardener. Our study shows that not only does ladybird color reveal how toxic they are to predators, but also that birds understand the signals that the ladybirds are giving. Birds are less likely to attack more conspicuous ladybirds." Although red ladybirds with black spots are most familiar, ladybirds are a diverse group of species and come in many different colors and patterns, from yellow and orange to even camouflaged browns. The bright coloration of different ladybird species acts as a warning signal, telling potential predators to beware of the foul smelling, poisonous chemicals these beetles use for defense. The researchers measured toxicity using a biological assay, by counting the number of dead Daphnia (tiny crustaceans) in water containing the different ladybird toxins. The results show that five common ladybird species each have different levels of toxic defense. New research findings by John Innes Centre (JIC) scientists in the UK have helped to settle an important debate in the field of epigenetic inheritance. 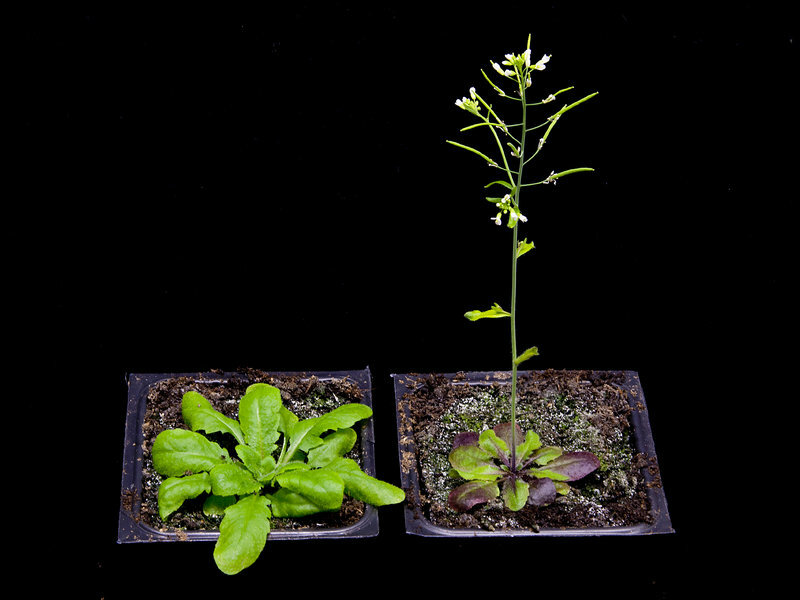 Using the flowering plant Arabidopsis thaliana as a model for their research, Professor Martin Howard, Professor Caroline Dean, and members of their labs, have been trying to understand how organisms “remember” past events at the cellular level. Previous work had shown that expression of a gene called FLC (the flowering locus C gene), which serves as a “brake” to stop plants flowering until after winter, is repressed by exposure to cold. Furthermore, the amount of repression is epigenetically “remembered” after winter to permit flowering at the appropriate time. In many organisms, DNA is packaged around histone proteins to make a structure called chromatin. Intriguingly, the level of FLC repression is correlated with the level of cold-induced chemical modifications to the histones at the FLC gene, added by a protein complex called Polycomb Repressive Complex 2. But are these histone modifications or other local features of the chromatin the cause of epigenetic memory, or are they a consequence of memory stored elsewhere? The findings of a new study, published online on May 8, 2015 in the open-access journal eLife, provide compelling evidence that has helped to settle this long-standing debate of where this memory is stored. The eLife article is titled “Local Chromatin Environment of a Polycomb Target Gene Instructs Its Own Epigenetic Inheritance.” Professor Howard explains: "We engineered plant cells to contain two distinguishable copies of FLC. When one copy of the gene is expressed, it generates a protein that glows red; when the other copy is expressed a yellow fluorescent protein is made.